November 6, 2017 – Shortly after the 1992 Los Angeles Civil Unrest, a funder collaborative emerged to improve socioeconomic conditions in three of the city’s most neglected neighborhoods. 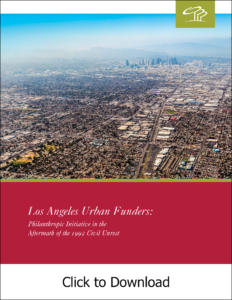 In all, more than 29 foundations participated in Los Angeles Urban Funders (LAUF), giving away more than $25 million over the course of a decade. Along the way, LAUF modelled new and effective ways for foundations to work with each other and with low-income communities. In the mid-1990s, even the idea of a place-based funder collaborative was novel, particularly one focused on multiple geographic areas simultaneously. But that was not all that made LAUF unique. “Decision-making in the collaborative was aggressively democratic,” says report author Elwood Hopkins, founder of Emerging Markets, Inc., who served as LAUF’s executive director. “Funders of LAUF ranged in size, scope and areas of expertise but we took significant steps to build consensus among all members.” In addition, all participating funders were required to not only contribute to a “community fund,” which helped jumpstart the initiatives, but also to at least one nonprofit in each of the target communities through their regular grantmaking. More than fifteen years after LAUF concluded, philanthropic and community leaders underscored its lasting effects. In the neighborhoods, there was a strong sense that the community’s internal infrastructure had been strengthened, resulting in new leaders and stronger organizations. While there was an admission that much more was needed to improve the underlying socioeconomic conditions in the specific communities, LAUF did help to open up investments from foundations, corporations and government that weren’t there before.